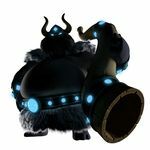 Lord Fredrik, the Snowmad King, shortly referred to as Lord Fredrik and sometimes only Fredrik, is the main antagonist and final boss of Donkey Kong Country: Tropical Freeze. He is the leader of the Snowmads, who took over Donkey Kong Island and claimed it as their territory. Lord Fredrik and his Snowmad minions invaded Donkey Kong Island on Donkey Kong's birthday. They blasted out the Kongs with the winds created by a magical blowhorn and stationed their ship on top of the Volcano, subsequently claiming the entire island. When Donkey Kong and his companions later return to the island, they encounter Lord Fredrik in the now frozen Volcano. He challenges the Kongs to a fight, but is defeated. Upon his defeat, he is blasted out of the island, crashing into the sea where his ships and other Snowmads are stationed. He also drops his blowhorn, which is now used by Donkey Kong to change the island back to normal, melting the snow and ice. In Super Smash Bros. Ultimate, Lord Fredrik appears as a spirit. Lord Fredrik is a massive Waldough. He has a dark mustache, two glowing sky blue eyes, and two tusks. Lord Fredrik wears a large double-horned helmet, a large white fur cape, a fur skirt, a belt with a snowflake-emblazoned jewel on the front, and black briefs. He carries a wooden horn, which is used to summon the ice dragon. The battle starts as Lord Fredrik prepares to send his minions onto the arena. Lord Fredrik begins the battle by jumping into the background and increasing in size. 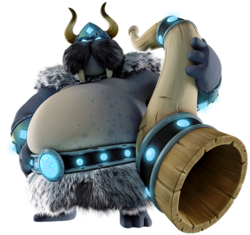 He begins firing several ice balls out of his horn at the Kongs, who must dodge them; some of them will progressively release Tuff Tucks, Tuff Fluffs, and Tenacious Tucks as the battle continues, which can be stomped on, picked up, and thrown at Lord Fredrik to cause damage. Lord Fredrik will begin darting from side to side when the Kongs pick up a Snowmad, but will eventually pause to adjust his helmet or laugh tauntingly. He will repeat his attack pattern until hit by a Snowmad, at which point he shrinks to his original size and returns to the foreground, trying to ram into the Kongs with his horned helmet. The Kongs must jump over Fredrik and land on his exposed back to damage him. If the first charge misses and Fredrik is not damaged, he may turn around and attempt another. If he stops the pattern, he will spring into the near platform, sinking them into the lava and moving onto the next platform. After taking a few hits, Lord Fredrik will roar in rage and begins a few new attacks. When he jumps to the background for his iceball attack, he will first use his horn to create a flock of ice dragons that crash onto the battlefield. The dragons are preceded by shards of ice falling from the top of the screen, allowing the Kongs to evade their dives. If the dragons do not hit the Kongs, they will freeze part of the battlefield, making it harder to maneuver. When Lord Fredrik returns to the foreground, his charge attack will occur at longer and faster intervals. After receiving enough damage, he will perform a spinning jump, which creates five lava pillars that lift up all the platform except one. Once the lava pillars subside, platforms will temporarily be airborne and sink into the lava one by one. Once Lord Fredrik takes enough damage, he also summons ice dragons from his horn. The ice dragons fly across the stage, but leave room for evasion by either jumping or crouching - the Kongs must jump over the low-flying dragons and crouch under the high-flying dragons. Lord Fredrik's battle tactics and character feature several homages to King K. Rool, such as the shoulder charge and jumping attacks. The attack where he goes onto the field and fires ice dragons from his horn is an imitation of a variation of Kaptain K. Rool's blunderbuss barrage attack. Also, the fact he stays in the background before being indirectly hit by the Kongs might be a reference to the fight against Baron K. Roolenstein in the Knautilus from Donkey Kong Country 3: Dixie Kong's Double Trouble! 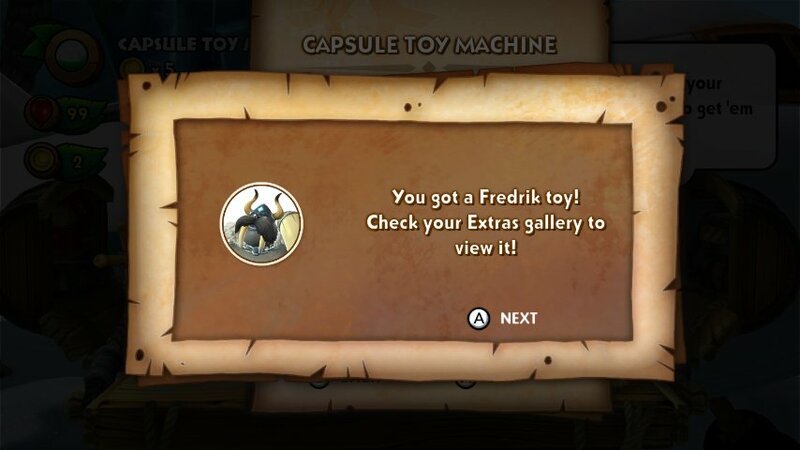 ↑ "You got a Fredrik toy!" This page was last edited on April 13, 2019, at 22:39.